‘After the Fair’ is a free festival for fun loving people who like to get amongst it. If you want to sing, play music, tell tales or dance, you will have a good time at Bampton where you can do any or all of these things in the numerous sessions from Friday evening to Sunday night. Listeners are also very welcome. When we sadly made the difficult decision to cancel After the Fair 2016, we also promised to review the situation and keep an open mind about running the event again in 2017. With that in mind we wanted to let you know that after a recent visit to Bampton we have sadly decided that the problems are still too large. The risks regarding new publicans and business continuity, combined with the level of energy needed to run such events, has led to a firm decision not to run ATF 2017. It has in the past been organised along these lines: Some of the sessions are ‘led’ by guest hosts. This is to ensure that there is always something going on and also that the more reticent participators get a look in! There is also plenty of room for those who prefer to do their own thing. See the programme for details. A dozen or so each of Irish and Breton singers, musicians and dancers join us for the weekend and you can find yourself alongside them in any of the sessions. 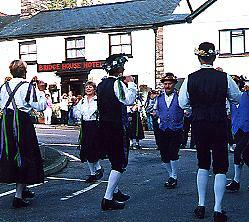 Dance displays take place in the town throughout Saturday and the street outside The Swan Hotel is a favourite venue. Look out for the Breton Dance workshop run by our Elliant guests. There is a Variety Concert on Saturday afternoon at 3.00pm – Guests to be announced ‘directly’! All Our concert guests are appearing for no fee in order to support the festival. Every year is a sell out – a great favourite with local people and festival visitors. A modest sum is charged for admission to the Concert.. 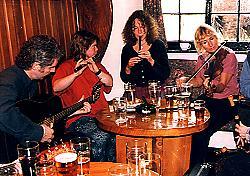 If you are not a concert goer, pub sessions continue throughout the day and evening. Sunday continues with pub sessions until the last survivors have had enough. Bampton is a picturesque small town (known locally as ‘the village’) on the edge of Exmoor. There are plenty of places to eat, from breakfast through to evening meals and there is also a good fish and chip restaurant - eat in or take away. All our visitors comment favourably on the friendly welcome they receive from residents and we work closely with local groups and organisations to ensure that this continues. There is good walking on nearby footpaths and further afield on Exmoor. 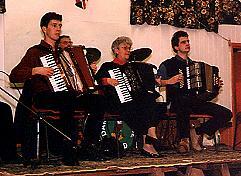 The festival is organised and run by Pennymoor Singaround. We all put in our work for no fee and we aim to cover the festival costs with proceeds from the concert, from local fundraising and sponsorship including contributions in kind, and from our collecting tins. Please contribute to these generously so that this weekend of musical creativity for the sheer joy of it, can continue. Find out how the Festival started - here.